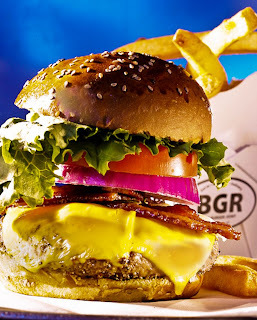 BGR Bringing 15-Pound Mega Burger to Atlantic Station This Summer!!! ATTENTION BURGER LOVERS: There will soon be a new kid on the burger playground and this kid is lean and mean!!! As reported first by Midtown Patch via What Now Atlanta, a place called BGR: The Burger Joint is expected to open at Atlantic Station early this summer and will be located in the space that Doc Greens used to occupy. Kinda ironic that we'd replace a SALAD place with a BURGER joint, don't you think? I took it upon myself to check out their website to see what they have to offer in this already fairly crowded burger landscape. Not bad, I must say. According to the site, their burgers are made from hormone free grain-fed beef served on freshly baked brioche buns. And, if beef isn’t your thing, they also serve turkey, lamb, tuna, & lobster burgers. All great options. Finally, if you’re bout that vegetarian life, they of course offer a traditional veggie burger. Other menu items include asparagus fries, sweet potato fries and various milk shakes. But, here's where it gets really interesting. On the menu, they have a burger affectionately known as "The 9 Pounder" (it actually weighs in at 15.4 lbs including bun, toppings, and condiments). It's been featured on Food Network, Travel Channel and some official I.F.O.C. competitive eating contests. This glutton sandwich that normally feeds 10-15 people is priced at a whopping $80!!! However, some of you wannabe Man vs Food-ers could possibly get it for FREE if you can eat the entire burger in one sitting. It says on the menu that they even throw in a free bottle of Maalox with the sandwich. Lol. I’m sure you'll need it. Might wanna throw in an ambulance and a quadruple bypass too. Smh. I know Nick has been looking to flex his competitive eating muscles lately so maybe we can talk him into trying it.